Looking for a jeep in India? Important Notice - We do not vet or check advertisers or respondents and we make absolutely NO recommendation of any advertiser or guarantee or warranty on any item shown on the site or linked from it. All transactions are between the vendor/purchaser at their own risk. comments I have a jeep ford M151 from 1964 and need an engine for it - can anybody advise me where to get it ? comments One brand new rear road spring. One jerry can and carrier. One field telephone box, (without phone. )All these parts came from my 1942 MB, but the radiator might not be an origional one. comments Wanted - a full set of rear lits for my '61 Hotchkiss jeep. Also a complete pair of cushions required. comments Hotchkiss Jeep rims 16" used, for sale. Can send pictures. comments some ww2 jeeps had a stromberg carb, BXV-2. do you have any carb bits please? urgent rebuild required!! comments For sale, NOS wwII 6V coil, still sealed in its grease package. The one pictured is another one i have opened to give an example. It is the second model used on the jeep, without the earth terminal on it (screw at the bottom). There is some red markings on the body (like 6 volt), and a "made in USA" in raised letters on the bakelite top. I tis supposed to be Autolite, but one the ones i oppened i haven't been able to locate the brand. Now impossible to find parts, working very well on my jeep and very nice original old looking part. Don'tt miss a chance to get one like this ! Price is 170 €, shipping anywhere in the world included. Paypal payment only. comments I would like to buy a set of leads for my 1958 HOTCHKISS M201 Jeep, second hand or !!! comments Willys MB/Ford GPW/GPA, Slat grill original pintle hook with "F" marking on it. 250 $ or 180 Euros. comments Looking for a good Willys MB / Ford GPW T-84 transmission to replace my own which needs a major rebuild. You need to supply your original control box for the basis of the conversion, this need not be working but it must be complete with base, lid and internal circuit board onto which the terminal lugs are fitted. Later on we hope to have a supply of regulator boxes so that we can sell complete units but until then we can only convert your own existing parts. When you pay with Paypal you will then need to post your existing control box to use for conversion. Typical turn around time from receiving the control box is 3 to 5 days but at busy periods please allow a little longer, we will send out your converted part as soon as we can. price £20.00 (GBP) + p&p. comments Early Willys Jeep Steel one-piece Wheels, not combat rims. I can trade or swopcombat rims for the right wheels. I'm Mark and i wish to restore a Willy's Jeep. comments Hello, I'm restoring an M38A1, and looking for numerous parts, including: a radiator (don't mind one needing rebuild if the price reflects this); front drive shaft (CJ2A/CJ3A/CJ3B/CJ5 or M38 will all fit); brake cylinders; windscreen glass - what have you? comments Canvas side doors needed. I have a friend in the US who has a Jeep Model 151 A-1 converted to military ambulance. He is looking for the right and left side doors. He has the rest of the covering. anyone knows a manufacturer? or where i can get these pieces. comments Thanks to this site I have sold a lot of parts to many customers. I have an abundance of NEW OLD STOCK and good second hand also reproduction parts available. The prices vary however I will assure you the prices are very very cheap (compared to what you are currently paying) the freight adds a bit to the price but it is still the cheapest option to secure great parts. The range of parts is enormous If I do not have it I am quite sure I can secure it for you. comments A WW1 Periscope 'Adams of London' imprinted, with a capital E beneath. I believe this to be Model No 30 - complete with cloth bag. comments I am selling a job lot (qty of 8) exhaust pipe flange gaskets for Willys Jeep G503 and Ford GPW vehicles. These are Victor F5360C gaskets which are discontinued and no longer available. The ID is 1 7/8" and the stud holes are 3" ctr to ctr. These are the premium quality Victor exhaust gaskets with the steel fire ring to prevent burn through and blow out. The price for the lot of 8 gaskets is $20 plus shipping. I do not take Paypal - I only accept payment in cash or postal money order, hopefully you will trust me. comments WANTED!! A fully restored 1959 CJ3B engine or the name of a good restorer, please! comments Wanted a set of wheels for a 1944 willys jeep don't mind if they need a little work but don't want to have to go 100s of miles to collect them. comments Limited number of NOS (New Old Stock) Ford Cap Hubs, Part GP-1139. comments I am an aussie living in Philippines I have available a lot of MB/GPW parts NOS/2nd hand/ Reproduction. At the moment I have the following NOS parts available prices in Aussie dollars. I can supply reproduction working capstan winches email if interested in any parts will assist with shipping/packaging. comments hi, i am restoring 1944 willys mb, does anyone have n/s/f frame section because mine is damaged, also need front floorpan and original rear main leaf springs. no md juan parts. comments Original Waffen SS Dagger, Gottlieb Hammesfahr Solingen Foche. 100% Original. comments HI. IM LOOKING FOR PARTS TO REBUILD MY WILLYS MB JEEP. INCLUDING A BODY TUB, SEAT FRAMES, WINGS, GRILL, HOOD AND WINDSCREEN. 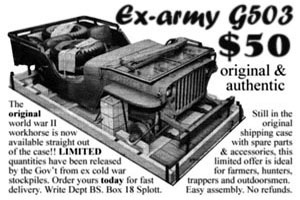 i'am looking for a 6 Volt Sirene for my Willys Jeep. Original or a good Repro. Im looking for a willys MB or cj2a tub for sale. comments Hi, I'm looking for a bonnet for a Jeep M38A1. Does anybody have one or know where I can get one in the UK. comments Hi! I am looking for a winch for a jeep willys mb 1944 - do you have one of this? what would be the price and would you ship to switzerland? comments Wanted set of 5 wheels / rims, either combat or standard 16" rims for my 1945 Willys MB, also oil filter complete, top bows and windscreen / wipers complete ! comments X5 Combat rims for 1944 Willys Jeep, rear seat, frame work for top canopy. comments I am wanting a front bumper for a 1984 Jeep j 20 truck,it is made of aluminium,but a steel one would do,i would pay upto 100 pounds for alloy one depending on condition. mobile no is 07715318715.
comments I Have the following new but old stock spares for sale. Numbers taken from the UCD parts book. Will like to know price and avalability for this parts. comments FOR SALE: 1 NOS (New Old Stock) Willys MB Radiator still in the crate. This radiator would be for somebody who either collects NOS WWII jeep parts or somebody who is restoring a WWII jeep to a Factory Class using NOS parts. Please contact me for price and details via email. comments For sale is a GPW head 4 cylinder ford fits military jeep 1941-1945 has been machine shop checked in perfect condition. comments Looking for orginal or NOS pair of single hand wiper. US origine. AnnÃ©e 1943. 850 heures au compteur. comments hi i have 222 nos military issue firestone f-40 spark plugs for sale all in boxes and wrapped in cosmoline asking price is $10.00 each plug if intersted in any or all please email me thanx. comments WWII jerry can. Has WD mark 1944 RTMP embedded. One end has P002 7772 stencilled in white. It is red tagged CIVGAS F-50. It appears to have its original khaki green livery and has led a charmed life in the back of our shed for many years. Although I cannot guarantee it am fairly certain it is still able to carry its quotas of fuel. It was last in service carrying lawnmower fuel. It has not been cleaned up but cannot find any condition problems other than the odd dent. My husband served in that war and died recently aged 94yrs. He no doubt picked this up on his travels! comments Hello. My name is Wayne Murray I recently moved to the Philippines I am an avid MB/GPA/GPW fan I owned several in Australia prior to my move. Since moving to Manila I have found an abundant of genuine and reproduction components. I would be glad to assist any of your readers in sourcing and dispatching parts for the above vehicles. I have also found a guy who is currently hand making a replica GPA once completed I will take photos and forward them to you for your members to enjoy. I am not out to make a fortune at other peoples expense I am a committed supporter of ensuring the JEEP survives and I am happy to assist in tracking down that elusive part. comments Private Number Plate - "55 CJ"
This plate is held on retention. Perfect if you have a 1955 Jeep CJ! the over head valve 4cyl went bad..
is there a place i can buy 1 or is there another engine that will bolt in its place.. I have a M38A1 roll cage for sale.i am in Bristol and the price is £130. comments I am looking for any all information on a very very rare 1942 103 wheelbase willys "jeep". Yes 103 wheel base. IS IS ALL AS ORIGINAL WITH ALL THE STA MPING ON THE FRAME , COWL ENGINE ETC... ... I am trying to find out how many were built for sure. i have bought the machine and will send pictures. comments Hi, I am preparing a restoration for M151 A2 and I would like to purchase the original radio,preferably still in working condition, accessories, components, name plate, lights etc. comments Looking for a 1947 Willy's Jeep engine (CJ2) in running condition. - NOS IRWIN SCREWDRIVER 11"
- FAIRMOUNT MADE IN USA PLIERS 6"
- 16 OZ (1 LB) FAIRMOUNT BALL PEEN HAMMER, 14"
- FAIRMOUNT USA ADJUSTABLE AUTO WRENCH 11"
- GEM OIL CAN 4"
Please email me for price and more pictures. comments Hi. Is there a spare part for Jeeps, a 5" lamp, brand marked Autoroche? can you tell me where i can buy this accesories? 1950 Model ratio 4.88 teeth 8/39. i need please tell me what can you do? comments Hi I am looking for a rear panal for a willys mb I would like an original so if any one is cutting up a willys body that still as the rear panal let me know. Also need 1 split rim/combat rim for a willys mb. comments Mark 14 gunsight power unit. Manufactured 1943 by Crosley Corporation for speery gyscope corporation. Unit is complete, and appears to be surplus due to the fact that guages were never installed. Has anchor stamping. Cylinder, head, head tie downs and electrical connectors all appear very good. This is a complete unit. still has original mounting nuts and washers. comments HELLO IM THEMIS FROM GREECE!MY FATHER HAS A CJ7 JEEP 2.5 ISUZU DIESEL 1983 AND ITS NOT EASY TO FOUND PARTS IN GREECE AND THEIR VERY EXPENSIVE!WE NEED MANY THINGS AND IF WE BUY FROM THE USA ITS ALOT FOR TAX AND SHIPPING!HOW AND WERE I CAN BUY AS CHEAP AND RIGHT PARTS FOR MY CAR?I DONT HAVE A PROBLEM TO BY FROM STATES IF IS THE RIGHT AND MAKE GOOD PRICE SHIPPING+PARTS +TAX!THANKS ALOT THEMIS !PLEASE IM WHATING YOUR IMFO! I'm looking for a machine gun pedestral mount for a Willys MB or a Ford Mounts on passenger side foot Step. If you do have an idea, pleased let me know !! comments I am looking for a 12v generator cover for a 1944 Willys MB military jeep. It is a radio jeep, model MZ-2. There are large boxes in the back to hold the radios, and a generator located between the two front seats. We are missing the generator cover, and also the back seat, which is smaller than the seat found on other models, because of the boxes. Any ideas where I can get either of these items? I have not had any luck so far. comments A trailer for a Willys military jeep. and 2 hinge for tailgate. comments I have a 1950 travel type trailer which has the name Rolla on the title. It is 15 ft long, 8 ft wide and about 8ft high. It looks like it was set up for cooking or whatever as it does have a cooking hood and sink in it. I do have pictures of it but am not sure how to get those to you. I was told it was a military trailer, and perhaps you would know about it and possible value. comments hi i would like to buy some parts for kaiser willys jeep 1968. i have been trying to get those parts but no option left.there for could you pls help me out for this.thank you for attantion. comments Hi I am looking for an Aqua Cheetah in any condition,s if you know of one anywhere,please drop me a line thanks. This is the name of it in WW II folks.hope someone can help with finding one anywhere on the globe? comments Hi, i am hoping to find a WW2 willys up to 1945 that is in need of restoring, prefere UK registered vehicle with duties paid but would consider anything at all. Condition is not important but originality is. Will even take on an incomplete Jeep. Please contact me with anyhting that you may have. Many thanks. comments M 38 body only. Wanna know the price and transportation service. comments Quantity of aerial rod sections to suit MP48 particularly first three. comments WANTED Used steering box or lever shaft assembly for '43 Ford Jeep. Must be in good condition, but I don't really need a new one. Terrible play in mine. comments Searching For Jeep Viasa Parts type HUJ6 1969 long wheelbase. 1 Front Spring 10 leaf. comments I am looking for the fastners of the half doors fastners with a pin in the middle. Would you plesae be so kind too inform me where I can buy these? comments I am in need of 3 or more 16" Hotchkiss wheels in good condition please, also a set of Genuine Ford GPW road springs, for a 1942 Script Ford. comments I am looking for a Willy MB w/snorkel system) for import here. All info pertaining to vehicle would be imperative. 1. range on 1 fuel load; 2. servicability and maintenability etc. comments I'm looking for a motor 1955 jeep can some one help? GPW handles+ the GPW front light & back lights + the sparton horn + the 1942-43 GPW reserve wheel support(1st generation). comments Hi, i'm surching for registration papers and a chassipart with a vin-number for VW Veep/Jeep. I need these for getting a registration number in the Netherlands. i already have the car . comments need a windscreen frame for my Jeep (not a CJ)with or without glass,I am a good welder so need not be a great example as long as i can repair it (,to help keep the price lower),I was recently stitced up for work i had done by the person i bought my jeep from and have had to strip/re build and totaly rewire!so am £2,000 down on my budget :-(. please let me know if you have anything! comments I am looking for a 1944 Willys MB body work. Please advise if there is any availability. comments I am Looking for a dana44 front axel right hand side shaft. comments WWII Willys MB Warner Gear T84 transmission parts (all parts but case). cyclender eng.if avaiable what is the cost. comments i got spare parts for ford jeep like speedo meter waltham usa, carb and dyanmo reapir kit all original Nos packed and many other stuff interested mail me now for more details. I am looking for two unusual wheels believed to have come off a WW2 vehicle or early 50s vehicle. Tyre size is 600 x 16 with a 4 stud hub fitting with a PDC of 4". I live in Belgium.I'm a great fan of the willy's jeep. Me and a friend have one.It's almost authentic. But there is one thing i can't find and that is the parachute. Do you have an idea where i could find this? comments HELLO,CAN YOU HELP ME PLEASE?I HAVE LOCATED A JEEP AND WOULD LIKE TO PURCHASE SAME.THE ONLY INFORMATION I HAVE IS FROM A PLATE ON INNER FRONT N/S WING .MINISTRY OF SUPPLY WV3 VEHICLE NO.19YH81.CHASSIS 322409.OVERHAUL DATE 4 55. B398(WV3129) FIELD 351 DATE 2 57. B398 (WV3221)AND UNDER BONNET(ITSELF)WSR/881611/VM 351.THE OWNER SAIS IT WAS USED IN SOUTH AFRICA AND IS A 1940 MODEL?IT HAS TRACE OF RED OXIDE UNDERCOAT WITH A LIGHT BLUE PAINT.IT HAS A ROUGH COAT OF TRADITIONAL GREEN ON TOP.PLEASE CAN YOU HELP ME ON ANY INFORMATION AND WOULD BE GREATLY APPRECIATED.THANKYOU IAN. comments Information wanted for format and style of numbering and decals for my 1945 Willys MB. I live in North Essex and would like to decorate my jeep in the style used for one of the local air or army bases of the area. Example, North Weald, Willingale, Stansted etc. comments 1942-1945 GPW Tub in good shape with fenders, hood and grill. comments I have a 1975 Mitsubishi J26 (CJ3B variant) Jeep. country UKcomments hi, I am seeking a supplier of duck canvas and US jeep style canvas. hopefully in the UK but anywhere is good if the price is right. I dont want a million yards but would like upto 100 yards for stock. I would like to hear from anyone who can supply or can offer an address etc.. Please note, we are not responsible for the content of external links or the veracity or otherwise of any information or advert contained on the site. Any transactions are strictly between the buyer/seller at their own risk. We do not vet or check any advertiser and use of this site is at your own risk.